Americans consume 815 billion calories of food each day, according to Mindfully.org. The site estimates that this is 200 billion more calories a day than needed, and it underscores Americans' love affair with food. Since most items are perishable and require a certain level of cooling, consumers try to pack as much food as possible into their refrigerators. However, overfilling the appliance can block air vents, restrict air circulation and reduce energy efficiency. Neither an overcrowded nor a nearly empty refrigerator is energy efficient. The refrigerator should not be filled to maximum capacity as this restricts the airflow and limits the appliance's ability to properly cool its contents. As a result, some items may spoil because they are not maintained at a proper cooling temperature. On the other hand, the refrigerator should not be empty either. 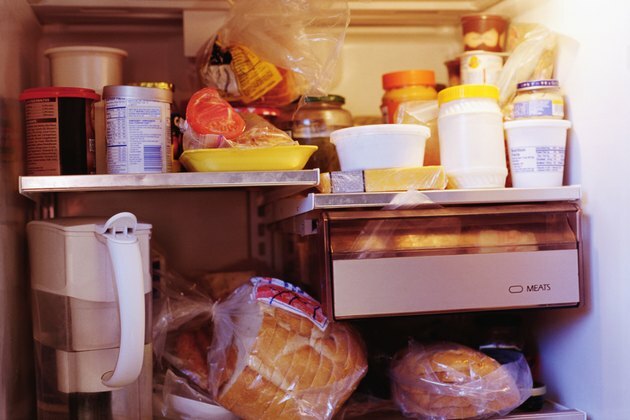 An article in The Washington Post asserts that in a well-stocked refrigerator, food absorbs the cold air which helps to chill the other items in close proximity. In an overcrowded refrigerator, the restricted airflow and limited cooling ability results in energy inefficiency. The refrigerator is one of the major household sources of energy consumption, and overfilling it uses even more energy. However, keeping it stocked to a comfortably-full level allows it to run most efficiently, which saves not only energy but also money on your utility bills. Ellis Mass, a spokesman for LG Electronics, says, "If all you have in there is some mustard and a six-pack of beer, you are using a lot of energy to keep just a couple of things really cold." You don't want to block the air vents. Even if the refrigerator is not overfilled, the placement of the refrigerated items can affect the appliance's cooling ability. According to the website HomeTips.com, a loaf of bread or some other object in front of the passageway will prevent the refrigerator from getting cold. 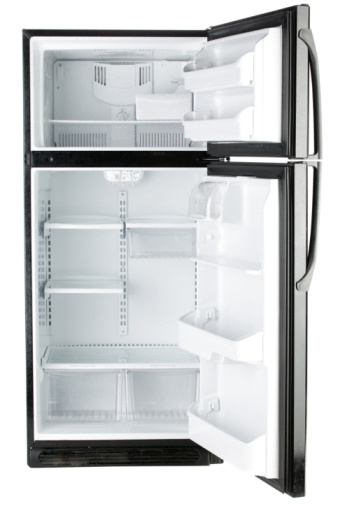 Frequently opening the refrigerator door negatively affects the appliance's efficiency as does a warm room temperature. In contrast to the refrigerator, a freezer can be stuffed to capacity as long as the airflow is not restricted. In addition, if you frequently overfill the refrigerator, or you're always taking trips to the grocery store, the California Energy Commission advises that you may need to purchase a larger appliance. Even though your existing refrigerator is paid for, the amount of money you spend in increased energy bills may justify buying a larger appliance that can better meet your family's needs.